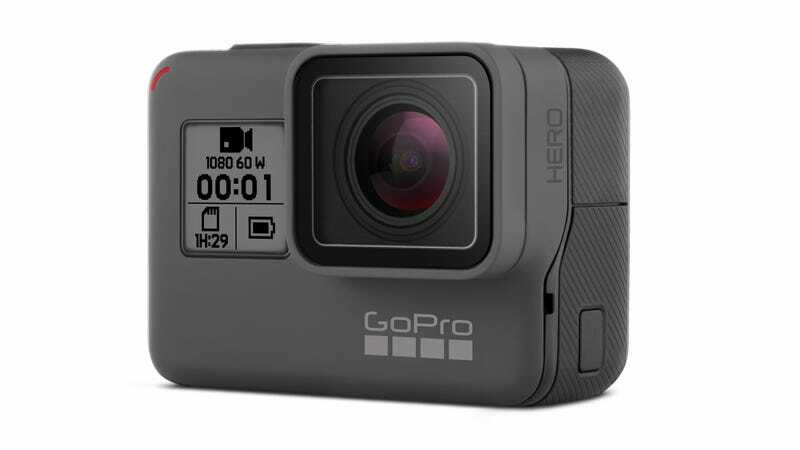 It might look like the $300 GoPro Hero 5 (which is now two years old), or the $400 GoPro Hero 6 (which was released last year) but this is actually a brand new, and much cheaper GoPro. Simply called the GoPro Hero, this new $200 action camera will feature most of the best features of the Hero 5 and Hero 6, at half the cost. The big reason to buy a GoPro Hero 5 or 6 over something else is due to the quality of the 4K footage produced by such a tiny and durable camera. Unfortunately there’s no shooting 4K video with the new Hero. Instead you’ll be stuck with 1440p or 1080p. There’s also no shooting at high frame rates like 120 or 240 frames per second. The new GoPro Hero is strictly a 60fps or lower shooter. But if you can somehow get past that pretty big downside the Hero will include most of the other stuff that has traditionally made the GoPro superior to other cheaper action cameras. It’s waterproof up to 30 feet without additional housing, has voice control, video stabilization, and a 2-inch touch display. It also works with the loads of GoPro accessories already on the market. It’s not the first cheap GoPro, inexpensive Heroes have existed before, but it’s been more than two years since GoPro has offered a budget camera with an actual display. And this return to budget cameras could be a very good thing for a company that has struggled mightily in the last year. The company’s stock continues to hover around an all time low of $4.80 and since January has faced rumors of a potential sale. The reasons are multifold. First there’s the Karma drone disaster, which went off so poorly the company laid off hundreds in January. Second, the camera maker has been clobbered in sales by cheaper action cameras from companies like Sony and Yi. That was no doubt one of the reasons GoPro signed a licensing deal last week with Jabil (who actually builds many of GoPro’s cameras) to put its camera tech into third party devices. Finally GoPro has run into a problem also faced by the Apple’s iPad, where people buy one and rarely if ever upgrade it. A new cheaper GoPro Hero isn’t necessarily going to fix any of those problems, but it could entice people put off by the high price of previous GoPros. Until now you either had to spend a lot of money for a potentially too much camera or you had to seek out a knock off. Now you can drop $200 and get nearly everything that’s made GoPro one of the best action cameras around.